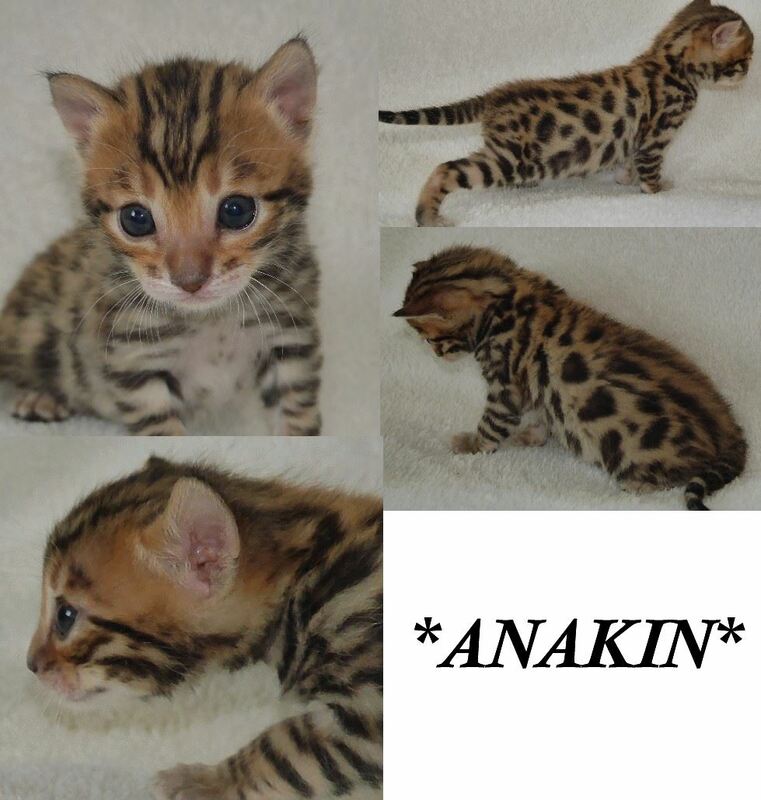 Availability : Anakin is no longer available. Now at six weeks old, it is much easier to get videos than pictures! I think you can agree that he is going to be a gorgeous Bengal cat with great expression, a beautiful face, & a great profile & chin. The son to Poolside Rascal Cats of KotyKatz of KotyKatz and KotyKatz Latvia. Already he is showing promise of being what is known as a “true golden” Bengal. This is the result of the crossing of a silver parent and a brown parent. The result being a golden colored Bengal with outstanding contrast and a very low amount of ticking to the coat. Anakin would be the first true golden Bengal born here! It will be a lot of fun to watch him grow and develop. Currently under evaluation. We all remember Anakin from the Phantom Menace, a young slave with unusually inherent powers of the Force. He also makes an appearance in the new film as a Force Ghost. Anakin would of course go on to become Darth Vader, who is one of the most iconic characters of the Star Wars franchise. From our Star-Wars the force awakens name-themed litter, with Rey, Phasma, Anakin, Kylo, and Porthos. This entry was posted in Bengal Kitten Gallery, Gallery and tagged True Golden bengal kitten. Bookmark the permalink.